Electric cars have been on the market for a number of years now. Electric cars on the market are gradually becoming mainstream. It used to be only the tree huggers. As well as people who cared about environmental issues that supported electric cars. As the market matures and the products improve more and more people are taking notice of electric vehicles. They considering them as a real alternative to a gas powered car. 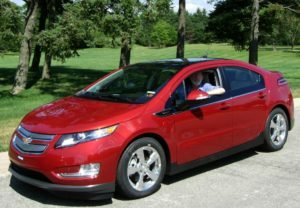 We are also looking forward to when the Chevrolet Volt, pictured in this picture, will be offered in Canada as well as the US. Nissan leaf – 80 kilowatt(80 horsepower) motor, heated seats, backup camera, Bluetooth, cruise, heated steering wheel and a range of 129 kilometers. Another important factor that is making electric cars or interesting to consumers is that there is an increasing number of charging stations. For electric cars to really take off, owners have to be able to depend on locations where they can take their cars and recharge. Otherwise these cars will be Limited to commuter cars and for one car family’s they are just not attractive. Virtually every major car manufacturer is developing an electric car to take advantage of the increasing demand. Couple electric cars with self driving cars and you have a powerful momentum that will lead a significant change in the industry. Electric distribution stages will proliferate to answer the need. Right now Tesla is probably the most famous name with a car that has beat all of the safety ratings. They will also have other electric cars on the market in 2017.